Aggregates are the vital components in concrete. They are granular materials obtained from the natural rocks, crushed stones as well as natural gravels and sands. The aggregates are amalgamated with a binding material in fixed ratios to form concrete. Aggregates normally capture about 70% to 80% of the concrete volume and they significantly affect the different properties like strength, hardness and stability of the concrete. Aggregates function as fillers or volume increasing components. 1. They are used as an underlying material for foundations and pavements. 2. They are used as constituents in portland cement concrete & asphalt concrete. 1. It should be chemically static that means they should not respond to cement or any other aggregate or admixture. 2. It should contain adequate hardness to avoid scratching and erosion in the hardened state. 3. It should contain adequate toughness to sustain impact and vibratory loads. 4. It should be physically strong to carry compressive and normal tensile loads in ordinary mixture. 5. It should not contain impurities, inorganic or organic in nature for which the quality of concrete will be affected significantly. 6. It should have capabilities to produce usable plastic mixture after getting mixed with cement and water. 7. It should be rigid, stable and clean and not contain adherent coatings & organic matter as well as significant amount of clay. 8. It shall not include injurious impurities like iron pyrites, alkalis, salts, coal, mica, shale or other materials. a. Minimize the cost of concrete – 14/ to 1/8 cement price is reduced. b. Minimize thermal cracking – 100 kg of OPC contributes to 120 C temperature surge. (A) Aggregate Types on the basis of Grain Size. Here, two types of aggregates like Fine and Coarse are found. (i) In the Fine Aggregates, the grain-size remains among 4.75 mm and 0.15 mm. These move through from sieve containing mesh size of 4.75 mm and are preserved on a sieve of 0.15 mesh size. Sand belongs to the most commonly accessible natural Fine Aggregate. ii) Coarse Aggregates: These are kept on the sieve of mesh size 4.75 mm. Their upper size is normally around 7.5 mm. 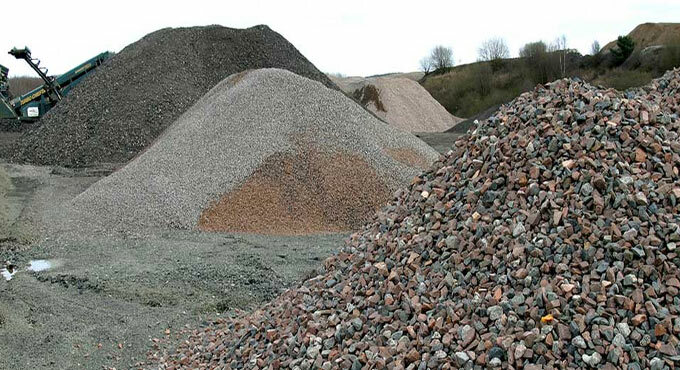 Gravels from river bed are considered as the superior coarse aggregates for the production of common concrete. In case, they are not easily found, appropriate rock types are crushed to the required particle sizes for developing coarse aggregates. (B) Types on the Basis of origin. Based on the origin, the aggregates are available in three types. (i) Natural: These comprise of all types of fine and coarse aggregates which are accessible in almost ready to use form, from natural resources. Examples : Sands from river beds, pits and beaches, And gravels from river banks. (ii) Bye-product: These comprise of materials procured as wastes from some industrial and metallurgical engineering Operations, which have suitable properties to be utilized as aggregate. Examples: Cinder generated from burning of coal in locomotives and kilns. Slag are procured from blast furnaces as Scum are the best example from this category. (iii) Processed: These develop a special class in Aggregate. They are specifically built up for being applied in producing Quality Concretes. Examples: These range from burnt clay, Shales, vermiculite’s and perlite. They are treated as vital components of lightweight Concrete. Based on the density, the aggregates range from standard or normal, high-density aggregates, light weight aggregate.